A pervasive urban legend circulating Berlin in recent years describes a creature called the Nachtbockkäfer (literally “night-goat-beetle,” often abbreviated to NBK), known to burst out of derelict structures in impossible near-silence, and retreat just as quietly, leaving only slight gaps and fractures. 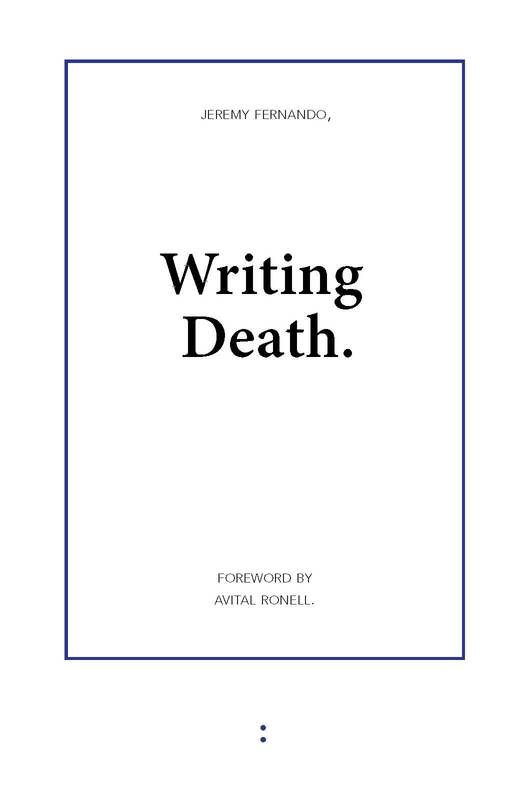 Those who try to pursue it go missing. Although this figure appears confined to contemporary Berlin, its iconography is in fact antique, with an origin traceable to the coast of the Black Sea. The Roman settlement of Albaquadrum and environs (latter-day Euxinova) that followed the emperor Domitian’s conquest and division of the Moesian provinces (87 CE) fostered the written transmission and refinement of regional folktales and legends. 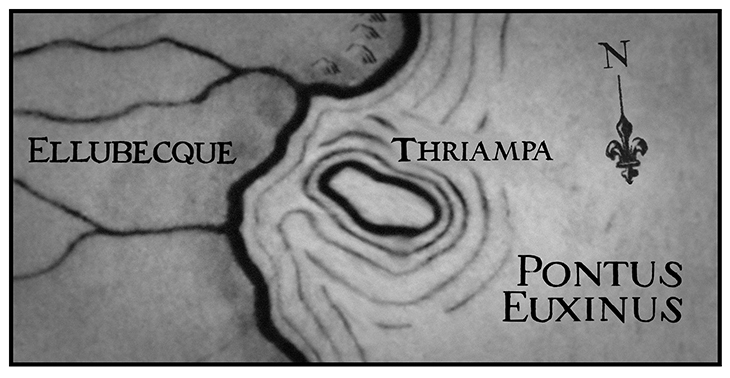 Prominent among those derived from the island province of Thriampa was the story of Lapurnippas, the rotund old guardian of the high-born orphan Pampiphlorine (popularized by Thaliopus in the lost prose epic Spruzendel and Pampiphlorine) and disciple of the forest deity Arbrocomesus. 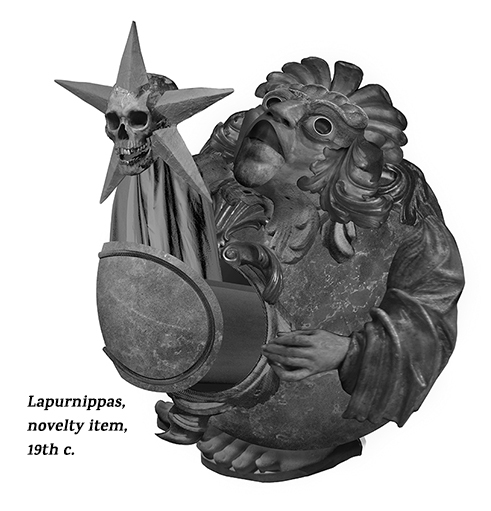 When bandits swarmed the island, Lapurnippas’s navel metamorphosed into a gilded tunnel leading to the subterranean abode of Arbrocomesus, filled with mineral and supernatural treasures. None but Pampiphlorine and her retinue were allowed inside, and intruders were met with death or — in the cases of Coccidillio (a termite-like buffoon), the “bandit maiden” Plundribel, and some others — comedic expulsion. 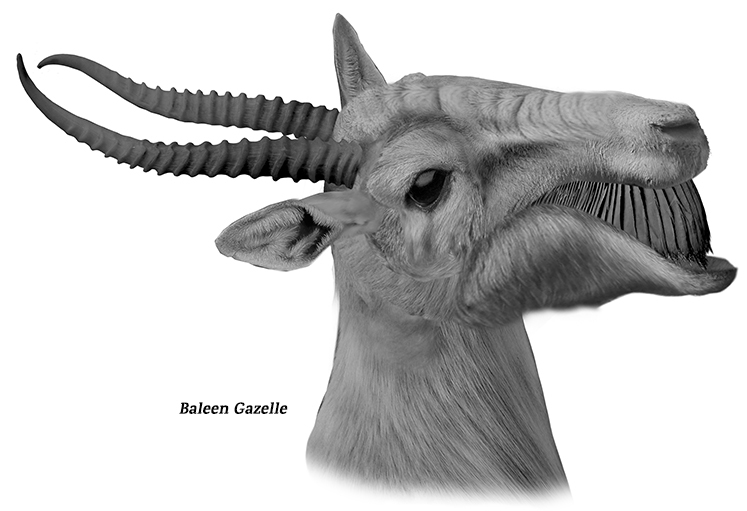 In 1844, the illustrated magnifications of various “air plankton” consumed by the Baleen Gazelle (G. gazella edentulata, native to the Euxinovan coast) garnered public notoriety, including the fry of the Balkan mallardfish (Lophius pontus). 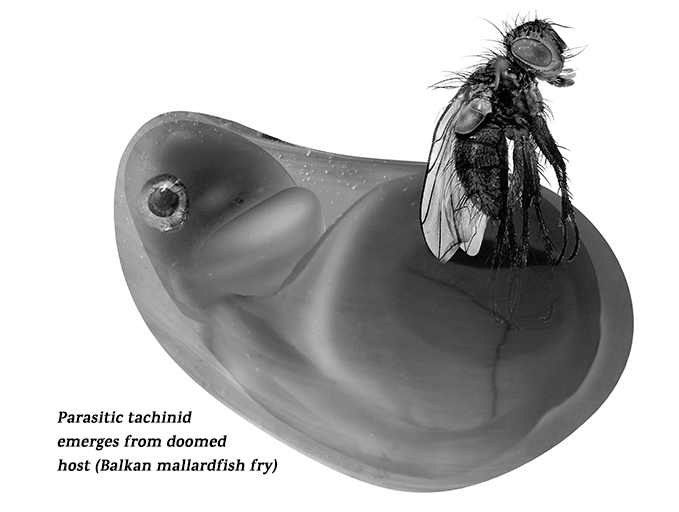 The latter was favored by caricaturists for its susceptibility to certain parasites, which were observed bursting from their host in a way deemed similar to the ejection of Coccidillio et al. from the belly of Lapurnippas. 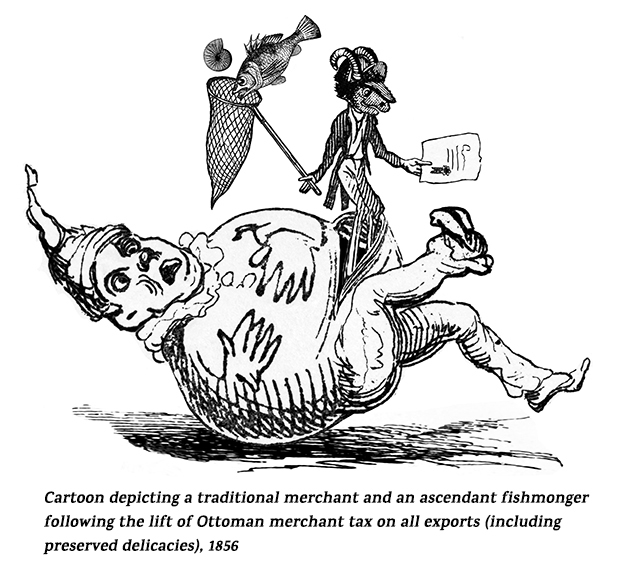 Subsequent illustrations, such as found in the popular satirical magazine Charmident, muddled distinctions between the myth and the natural phenomenon. 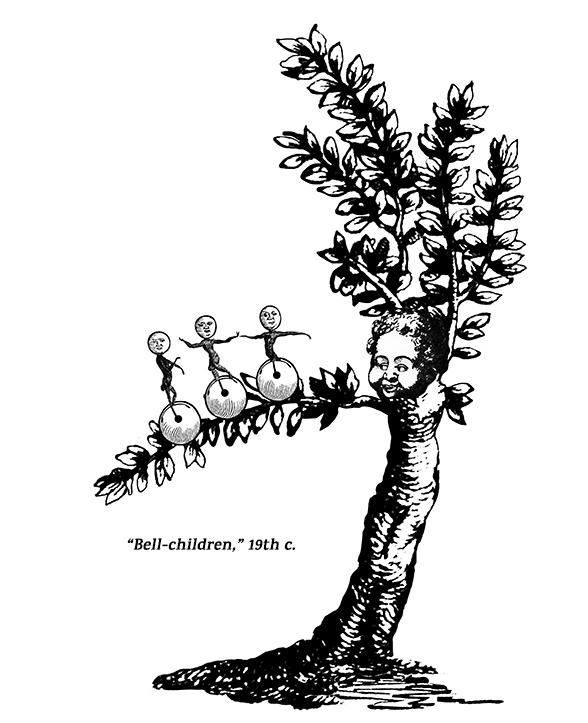 This basic motif made its way into children’s entertainments, which conflated Lapurnippas with the popular Euxinovan game of ludupillar, recasting him as a “magic ball” from which helpful or harmful figures would leap (depending on the story). Puppet troupes (notably Clavenneck’s Pavilion at the Parc d’Urongelex) introduced unpredictable endings via prop globes rigged to eject one of several characters randomly. The novelty for this dwindled once a distinct audience favorite emerged: the “Coelobonese Imp” (derived from recently translated folktales of Sulepawak, known then as Coelobon). 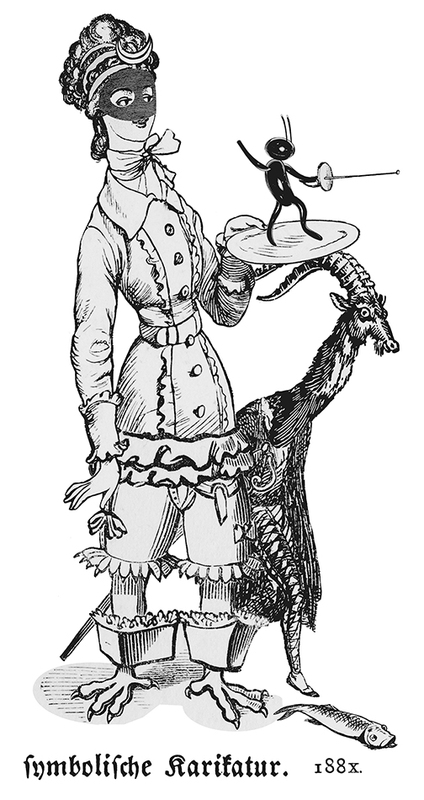 Later called simply “the imp,” this puppet retained some vague attributes of Coccidillio (and his variants) combined with a pair of small horns akin to those of a goat or ram. Itinerant puppet troupes absorbed this act, particularly certain Bavarian marionettists. 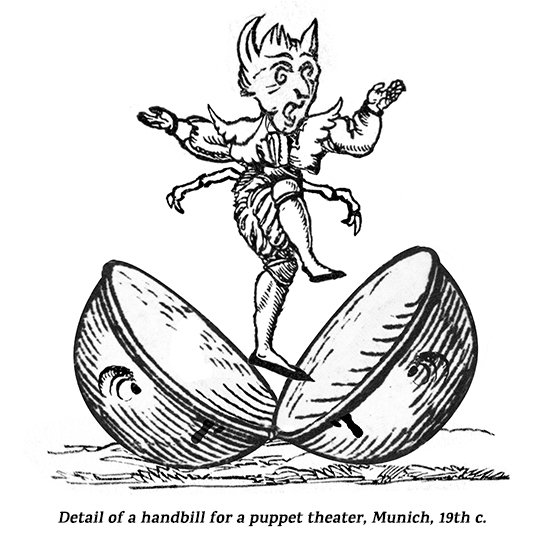 The adventure of the Zauberball became a minor fixture at the Münchner Marionettentheater, where the imp evolved into the “Der Bock-Käfer,” a puckish hybrid of goat and insect with characteristics derived from the weaver beetle (Lamia textor). A common toy featured the Bock-Käfer enclosed in a spherical bauble similar to a sleigh bell that released the figure and gave off a sound when shaken. 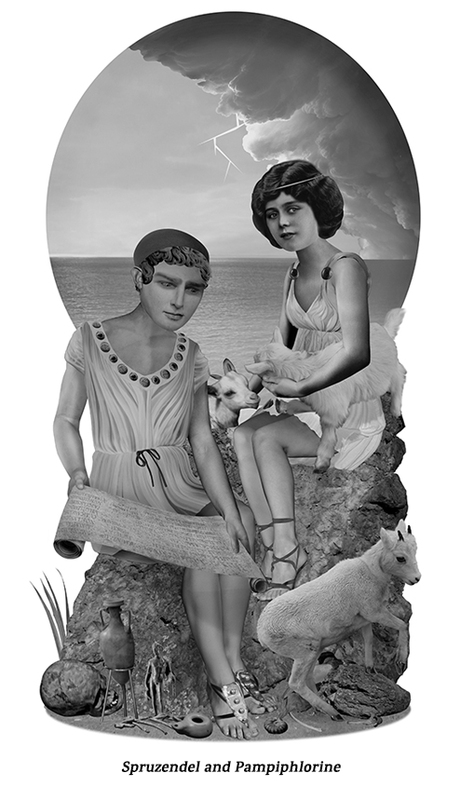 Combined with other figures in the same toy format, the Bock-Käfer became one of the “bell-children” that blossomed from buttons on Hans Hölzermann’s tree-coat in a series of pop-up Bilderbücher that somewhat eclipsed the toys, achieving greatest popularity in Poland during the 1920s. In Allied-occupied Berlin, the term “Bock-Käfer” was reportedly a moniker for certain undetonated directional anti-personnel mines rumored hidden in the rubble. It fell out of use again for roughly four decades (evidently absent from children’s ephemera as well), then resurfaced following the opening of the Centrum-Warenhaus Treptow in East Berlin. Construction of this state-run department store was plagued with delays and logistical problems right up until the fall of the Berlin Wall in 1989, and while it opened for business in 1984, the spherical Planetarium Café surmounting the building, though announced and built, never opened to the public. 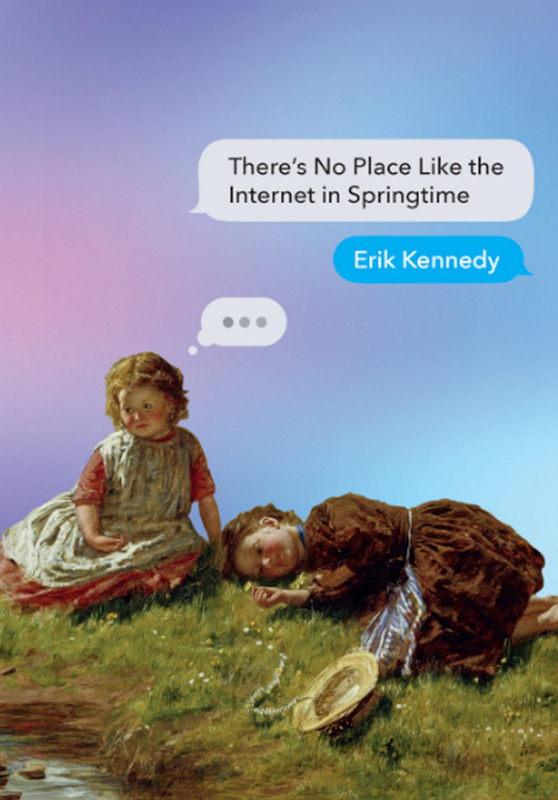 Following the building’s closure and visible deterioration in the 1990s, curious stories about it began showing up on electronic message boards. Most reported startling noises at night but an unnatural quiet at daytime (likely due to the activities of a nocturnal animal) coming from the Planetarium dome. 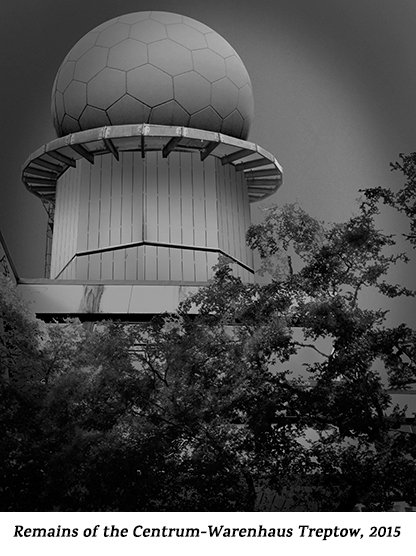 Its geodesic shape drew comparisons with the now also defunct radar domes of Field Station Berlin (Teufelsberg), where the US National Security Agency (NSA) and British allies monitored eastern radio traffic during the cold war. 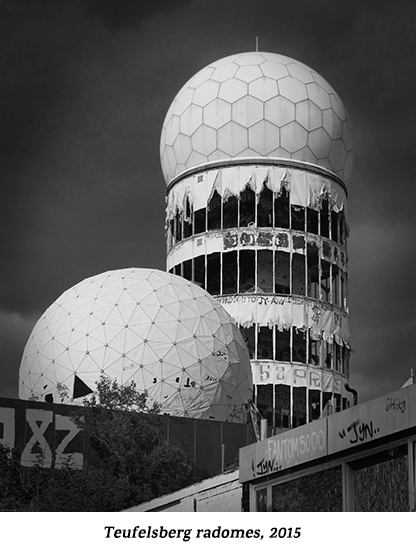 A persistent rumor that the Teufelsberg complex stood over an underground submarine base was the probable catalyst for speculations that the Treptow dome was “incubating” some type of cryptid. Mention of a “Bock-Käfer der Nacht,” accompanied by xeroxed illustrations from long out of print picture books, appeared in flyers for illicit walking tours circa 2002. 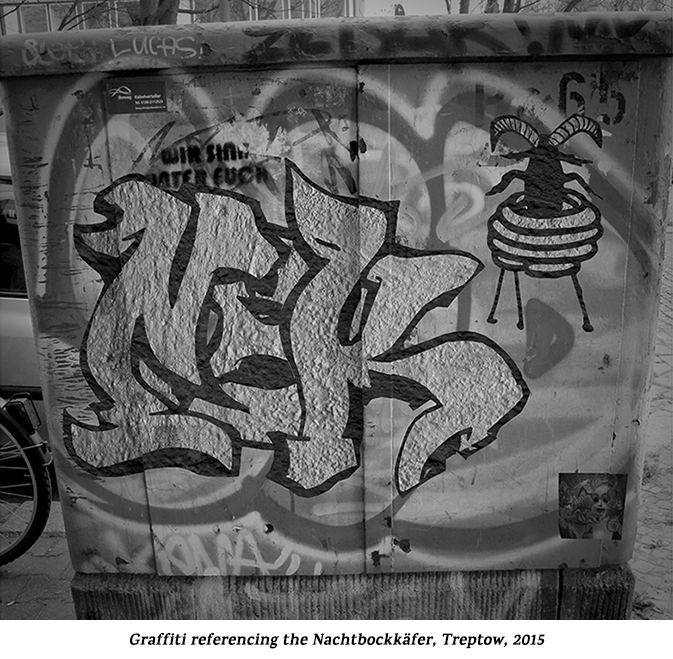 Since then, in street art and internet folklore, the Nachtbockkäfer has developed a robust identity less reliant on specific landmarks or past manifestations. The myth does, however, continue to revolve around decrepit or uninhabited architecture, ensuring that a Berlin setting will remain suitable for some years to come.